We spent a lovely couple of hours at the Active Norfolk - Gorleston In Gear, which took place on the lower esplanade on Sunday 12th March. As you can probably figure out from the title, Active Norfolk aims to promote getting the people of Norfolk out and about and active! There's most likely the equivalent in your area too. They offer a wide range of information on classes/groups for all ages and arrange free active and fun events for the whole family. We arrived at 12.30pm after a hearty brunch with our friends who also joined us. It was a bright sunny day and it brought the crowds out to take part in a family fun day focussing on getting out on your bikes. Chris is keen on cycling and has signed up for several events this year including Tour de Broads, Mollie is a good cyclist and Emily tries hard but is still a bit wobbly due to her nerves. We thought this was the perfect opportunity to kick start some Spring/Summer cycle rides and to boost Em's confidence. The Gorleston in Gear event main attraction for most was the Family Discovery Trail around Gorleston. I'll talk more about this in a moment. The first attraction we came to was some crazy bikes provided by Doc's Tricky Tricycles! These were specially adapted bikes all of which did the unexpected! For adults and children to enjoy, you would find yourself on a bike where the steering went opposite to the way you expect, on a trike which bumped up and down, a unicycle, tandems where one person pedalled and the other steers and many more. We spent a fun and chaotic half an hour in there! I think this actually helped to encourage Emily more than anything. We decided we needed to get signed up to the trail as the event was due to end at 3pm and we knew the trail should take an hour. Whilst we did this, another group of friends arrived and as their daughter was a little nervous we arranged for Emily to go with them at a slower pace, whilst their son went with Chris and the other kids. The object of the trail was to discover more of Gorleston and teams were given 12 questions to answer en route, those that complete the trail would receive a goody bag at the end. I didn't join them as my bike needed some repair (any excuse!) and neither did our friend so we spent the rest of the afternoon browsing the displays and activities on offer. From can crushing, pedal art and smoothie making in one tent, all aided by pedal power. To information services in another. The 3Sixty Bicycle Stunt Team put on a breathtaking stunt show, which we watched from the grassy verge. Further along the esplanade Pedal Revolution had their adventure course which consisted of ramps. beams and platforms. If you hadn't taken a bike along they had some to borrow. Pedal Revolution also offered bike maintenance and building bikes for charity. There was a sectioned off area for toddlers to learn how to ride with a wide selection of small bikes and balance bikes where several tots were whizzing round showing off their new found skills! Pretty soon it was time to stop for coffee. There was a quaint coffee cart there called Farriers. This was built into a revamped horse box and severed delicious coffee! After this I had a try on the powered bikes. These have a power pack built onto them to make pedalling easier. After a sudden surge when you first push the pedal (not enough to throw you off mind you) the bike travels smoothly and with minimal effort. I could be quite persuaded with one of these, I just need a few spare £k!!! By now the rest of our group had been gone for a good 1.5 hours and we had had a check in from Julie, they were on the last eroad back. So we headed over to the finishing point to wait for them. Soon they were pedalling into view! They were elated and after posing for a promo photo (!) they went off to collect their goody bags. The goody bags were drawstring sports bags with a bottle of water, a Natural Valley cereal bar, a cycling bandana, a bike bell, map of suggested routes around our local area and a waterproof bike seat cover. The kids were thrilled with their bags, as was Chris! Then it was back to Juan and Julies for coffee and cake. What a lovely way to end the day. 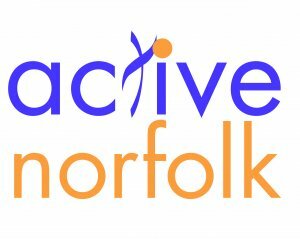 For future events please visit the Active Norfolk website or follow them on Facebook. We've marked their This Girl Can event in our diaries, where they will be hosting a whole month of events aimed to get girls active and runs through June 2017.